Who doesn't love ramen? Everyone has their own ramen-based memories. My favorite ramen memory is from college (probably just like your ramen memories are). DanT and I had just started dating and DanT was not the healthiest eater... He ate a lot of ramen. So, I decided to make us healthy ramen! This involved adding a bag of steamed birds eye mixed veggies. So, truth is, it was only marginally better for you. What you are about to see is not your college ramen. This is the good stuff. The professional stuff. 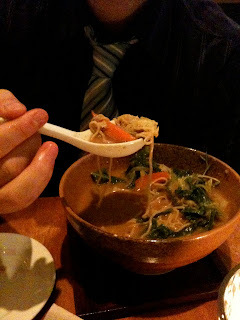 Souen is a mini-chain here in New York City of macrobiotic restaurants. They are not vegan as they serve fish. Vegan except fish. Annoying, but that's how macrobiotics do it. Souen opened a ramen restaurant last year: Souen Ramen Noodle Shop. I've been twice. This is a recap of tonight's adventures. These were some delicious dumplings, though I had a very hard time eating them. They were a bit slippery. Right after this picture was taken I dropped one into the sauce you see over there on the left and made a bit of a mess. Woops! But they were very tasty. Full of ground seitan. Yummmmm. DanT says he thoroughly enjoyed his curry ramen. 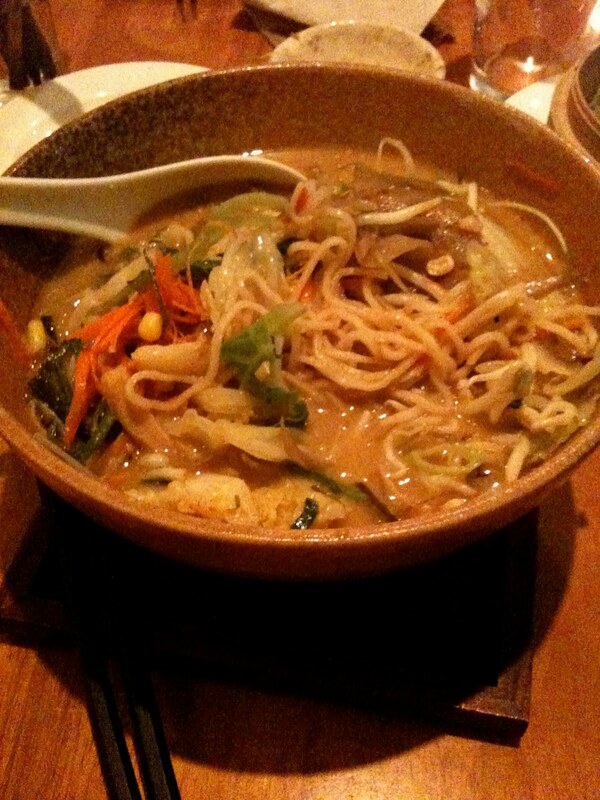 full of noodles and veggies, it had carrots and Japanese squash that were delish. I tasted some of the soup as well. It was well spiced with curry, but not overly spicy. DanT does not like overly spicy. My ramen had a broth made out of white sesame (i.e. tahini) and miso. It was salty and exactly what I had been looking forward to. There were bean sprouts, some lotus root slices, seaweed, and various asian greens. The only thing I could have done without were the hunks of ginger floating about. It was not the most pleasant surprise. But those noodles? Perfection. I treated DanT to dinner, so he treated me to dessert! You know what we were near? Lula's Sweet Apothecary. If you do not know of Lula's yet, you are way behind. It is the best ice cream ever. Not the best vegan ice cream, the best any kind of ice cream. Ask DanT (a recent vegan convert), and my friend Alissa who is not vegan and eats cow milk ice cream (I'm working on her...). They swear they have never had better. 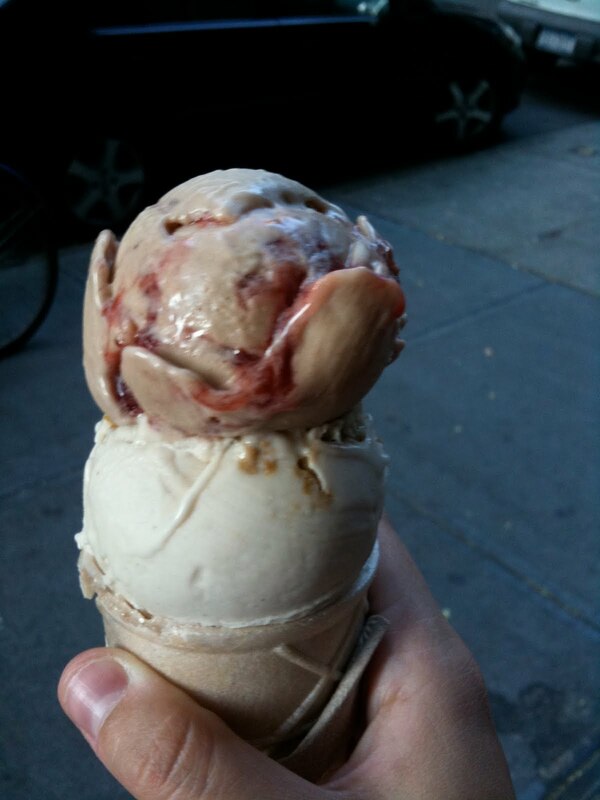 This ice cream is so creamy and flavorful that I do not go to the East Villiage without stopping by. Also, there is no artificial crap in this creamy dessert. The flavors taste exactly like what the label says because that is what it is made out of! Okay, lets see the desserts! 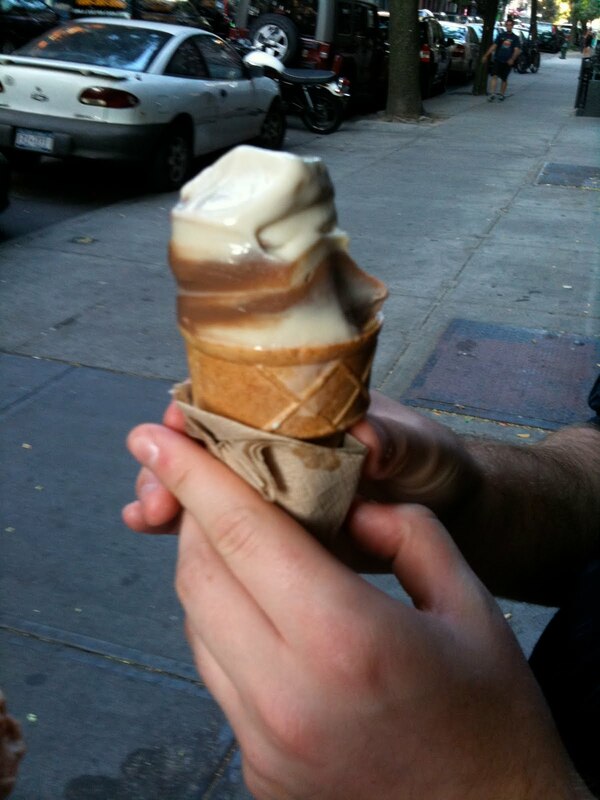 This was a gluten-free cone (why not? It tastes good and does the job.) with ginger cookie ice cream on the bottom and peanut butter and jelly on top. Both taste exactly as the name states, so I'm not going to bother elaborating. I'm pretty sure that these were both cashew based. Lula's has some flavors that are soy or coconut based, but most are cashew based. Trust them. They know what they are doing. DanT went at this cone within a second after it was handed to him. I didn't get a change to take a picture before he had mixed his swirled flavors together! This is chocolate and cake batter soft serve swirled. So essentially it is chocolate cake batter. That is exactly what it tastes like. I do like the cake batter. It tastes like licking the beaters in my childhood when my mom would bake birthday cakes. One last word about Lula's, it is run by the nicest people. The counter people are lovely as well. You can taste every flavor (on metal spoons that they wash and reuse, people!) without feeling like they are frowning upon you. Tip freely!